April 29th, 1910. My elder brother Thursby takes me from Loughborough to school at the King’s School, Canterbury. I am thirteen years old and entered for Holme House (Rev. L. H. Evans) which is on the old Dover Road. The King’s School itself is within the Precincts of the Cathedral and surrounds the Mint Yard. It has the Norman Arch attached to Big School. April 30th. Thursby took me to the cathedral in the morning when I should have been at the New Boys Roll-call. I was excused, however, because I did not know the rules. My bed, as a new boy, was next to the Dormitory door. Every boy on entering the room to go to bed solemnly lifted the tail of my night-shirt over my back as I knelt saying my prayers. The object was to emphasise by my naked posteriors that I ought to be wearing pyjamas. My nurse had not packed any with my school outfit as I had always worn a night-shirt at home. After a night or two of exposure I hastened to write home to have some pyjamas sent presto. Mr. Reay: My first form-master, a little man with a straggly moustache. He had a House called Langley House and could not keep any sort of order. One could not help liking him. Form III Lower 1910. Hugh Pitts is second from the right in the back row. The Form Master is Mr Reay. Mr. Everitt: A classics master very conscious of a Winchester background. He used to keep one waiting while he went on talking – making the new boy the cynosure of all the boys in the form. Percy Godfrey: The music master, an unorthodox type who never wore a gown. He sported loud checks and a red waistcoat with a bow tie. He made us sing folk songs in his class. I still remember the refrain of a Russian one “I’ve been marching till my feet are flat – nichevo, nichevo, yah!” He made great play of despising the cathedral music, and for this I hated him. Captain ‘Tic’ Bell: He commanded the School O.T.C., and did not let you forget it. He would ask every new boy on first sight of him with the Headmaster’s Book, ‘”What is your uniform great-coat number?”, and if you did not know he had no use for you. I had to join the O.T.C. to stop his eternal question – not that I liked it. He taught French grammar. The Rev. L. H. Evans: My Housemaster, always called Winks as he was or appeared to be half asleep. He wrote beautiful Greek script. A kind man, who kept perfect order without effort. On Sunday evenings he would ask a few boys to his study and read them Scotch tales in dialect. I used to have to hide myself behind the piano to stifle my laughter. He could be firm, though, and reduce one to size if necessary. Here I naturally recall Miss Bourne and Miss Priest: the two matrons at Holme House. They dosed us when ill, and listened to all our reasons why we shouldn’t be in school. They also comforted us when sad. They acted as our mothers, when we were away from home. May 7th, 1910. Death of King Edward VII. May 20th. Memorial Service for the King in the Cathedral. Troops lined the nave with reversed arms and heads bowed; we, with the O.T.C., among them. July 24th. Canon Galpin made his farewell sermon as Headmaster. Sept 20th. I return to K.S.C. The new Headmaster is the Revd. C. R. L. McDowall from Eton. Played football. The game was never explained to me, and I usually found myself at the bottom of the scrum, covered with mud, without any idea of what to do there. October 9th. The Archbishop (Randall Davidson) was at matins. His scarlet train was carried by two choir-boys, and the primatial cross by his chaplain. He made an impressive figure. He was a dignified and urbane prelate, known in certain irreverent quarters as ‘God’s butler’. November 11th . Lecture on ‘Spiders’. The Dean, Henry Wace, D.D., was a strong Evangelical of the old school. Tall, white whiskered, with a ruddy complexion, he wore a long buttoned surplice, with a stiff linen choker collar and tie. At the Communion Service he took his position at the North End of the High Altar. Canon A. J. Mason, D.D., Vice-Chancellor of Cambridge University, was the direct opposite. Elegant in his surplice and D.D. hood, he should have become Dean of St. Paul’s instead of W.R. Inge. Canon E. A. Stewart, with a big moustache, looked more like a cavalry major than a parson. He was remarkable for his fine reading of Old Testament lessons. His daughter Myrtle was voted the prettiest girl in the congregation by us all. Dr. Moore, Principal of St Edmund Hall, Oxford, was so immersed in his white beard that he could hardly be heard in the pulpit. All the same, he was said to be a great authority on the Gospels. Archdeacon Spooner of Maidstone was a correct Anglican dignitary, with the auburn hair of the family – he was brother of the famous Warden of New College – which, with freckles, made his daughter Ruth most attractive as she tripped daintily into matins. But Mrs Walsh, the wife of the Bishop of Dover, came sailing in, rattling the huge bunch of keys that hung at her waist. The Organist was Dr Charlton Palmer, a rather highly-strung man . He would shake his fist from the organ loft at the choir if they made a mistake. July 13th. Boat races at Fordwich v. Tonbridge. We won with our 1st and 2nd boats. July 14th. Cricket v. Felsted. Won. Nov. 21st. Long paper chase – 12 miles. Nov. 27th. Out of school. All boys wore black coats and striped trousers, and black and white straw hats. Sixth formers had a blue ribbon, the XV and the XI had special ribbons of their own, and everyone else a blue and silver one. Older boys wore stick-up collars, with wings if ‘bloods’ and straight otherwise, and the younger ones wore Eton collars. Scholars had a black gown and mortar-board with purple tassel for school, and surplices for cathedral. The Monitors were chosen from the Sixth form. They were allowed into town without leave, and carried sticks as a badge of office. They had their own studies where they occasionally dispensed justice. In the Mint Yard there were certain seats which were only used by them, and by colours. Stump cricket was played in the Mint Yard in the Easter Term, to the hazard of all passers-by. Cricket nets were set up in the Green Court in the summer, and matches were played on the St. Lawrence Ground. For football there was Blore’s Piece, and the Boat House was at Fordwich. September 20th, 1913. Mr Evans appointed me to be a Holme House monitor along with Evans and Field. This gives me a place in the Study and, best of all, a hot supper at night with meat and vegetables instead of just a slab of cheese like the rest of the boys. Hugh Pitts (1896-1988) was the son of a clergyman. 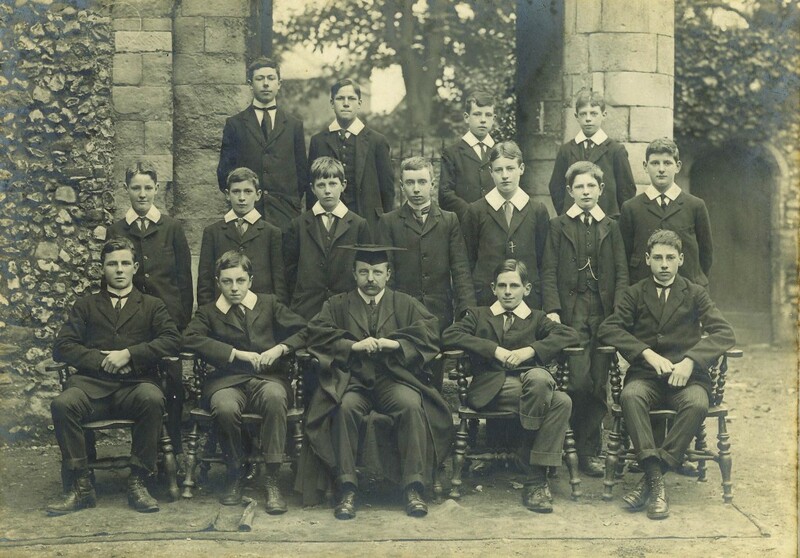 He came to King’s in 1910, where he was in Holme House, and left in 1914. After war service he became a planter in Malaya. For most of his time at School he kept diaries. These went with him to Malaya, were lost in the Japanese invasion of 1942, and were recovered, worn and damaged, in 1946. He later sent the School a version, elaborated here and there from memory. Extracts were published in The Cantuarian in 1977.